Human IL-7 R alpha, Mouse IgG2a Fc Tag (IL7-H5258) is expressed from human 293 cells (HEK293). It contains AA Glu 21 - Gly 236 (Accession # P16871-1). The protein has a calculated MW of 52 kDa. The protein migrates as 65-115 kDa under reducing (R) condition (SDS-PAGE) due to glycosylation. 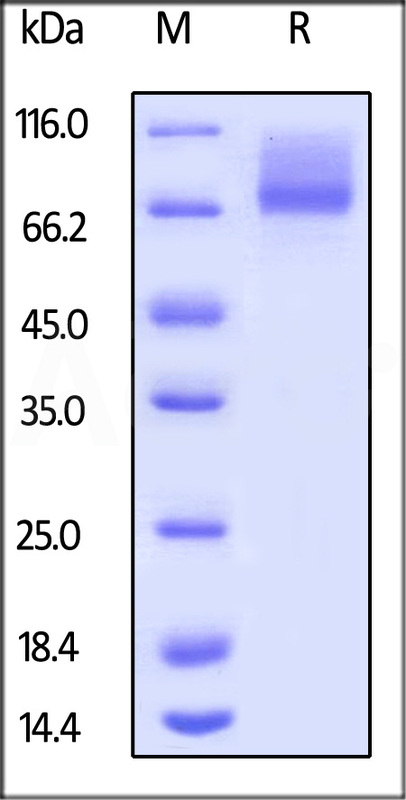 Human IL-7 R alpha, Mouse IgG2a Fc Tag on SDS-PAGE under reducing (R) condition. The gel was stained overnight with Coomassie Blue. The purity of the protein is greater than 90%. Immobilized Human IL-7, Tag Free (Cat. No. 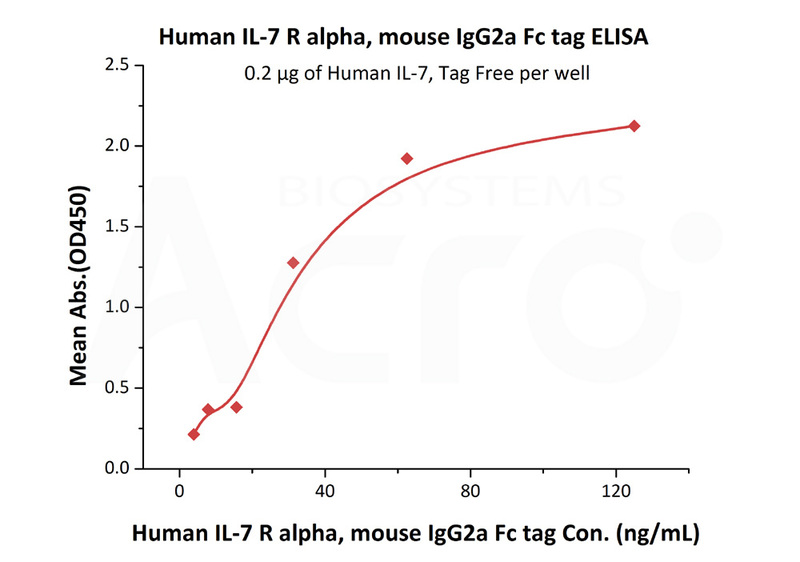 IL7-H4219) at 2 μg/mL (100 μL/well) can bind Human IL-7 R alpha, mouse IgG2a Fc tag (Cat. No. IL7-H5258) with a linear range of 4-31 ng/mL (QC tested). Interleukin-7 receptor subunit alpha (IL7Ra) is also known as CD antigen CD127, which belongs to the type I cytokine receptor family and type 4 subfamily. IL7Ra /CD127 contains 1 fibronectin type-III domain. IL7Ra /CD127 is expressed on various cell types, including naive and memory T cells and many others. IL7Ra /CD127 is receptor for interleukin-7 and also acts as a receptor for thymic stromal lymphopoietin (TSLP). The IL7 receptor is a heterodimer of IL7R and IL2RG. The TSLP receptor is a heterodimer of CRLF2 and IL7R. (1) Noguchi M., et al., 1994, Science 262 (5141): 1877–80. (2) Kroemer RT., et al., 1997, Protein Eng. 9 (12): 1135–42. (3) McElroy C.A., et al., 2009, Structure 17:54-65.